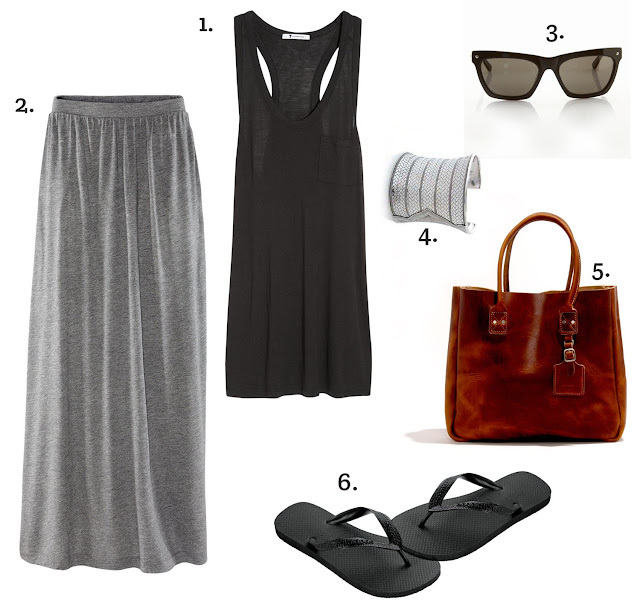 A simple outfit that's becoming my go-to uniform for summer weekends: a T by Alexander Wang classic pocket tank, a jersey maxi skirt from Zara, Rag & Bone Vespa sunglasses, Hawaiana flipflops (invisible, but there), a great big silver cuff from a market in Peru, and a solid leather tote I picked up at the Grand Bazaar in Istanbul many moons ago. Most of that's not available anymore, but you can come pretty close. Simple, straightforward, summery goodness. Just toss a notebook and/or ipad in the tote, head out for breakfast at an outdoor cafe in the breezy early morning hours, and bask in the beauty of an easy summer day off. Of course, not everything is as simple as it seems. I do have a few tricks up my proverbial sleeve, and if I didn't share them with you it just wouldn't feel right. It's all about the undergarments. Let me clarify, I am not advocating shapewear for everyday purposes. Just thoughtful undergarments. Which in this case means double-bra-ing it. That's right. One for lift and shape (come on, we all like a little lift and shape, don't lie) - my favorite is this one from Calvin Klein - and one for a little more sporty coverage, because with those A Wang tanks, everything shows. I've mentioned these little GAP bralettes before, and I will continue to do so until they stop making them, because they are perfection. So yes, what I'm saying is, I wear them both. At the same time. And it is awesome. My other little secret comes out of necessity. Big confession: I suffer from chub rub. Always have, always will. If you don't know what that is, you can skip over this part because it doesn't apply to you. If you feel me, then do as I do, and just pop on a pair of thin capri leggings under your maxi skirt, and go to town. And it seemed like such a simple outfit, didn't it? What's your hot weather uniform? Do you have to take any secretive measures to make it work? I know they make all these glide-y sorts of balms that supposedly solve the chub rub issue, but I've tried a few and none of them have really worked for me. They do for a bit, but rub off with sweat, plus some of them have even stained my clothing. Ugh. Double ugh. So I'm happy with a pair of really lightweight cotton capri leggings, they actually help me feel cooler since they sort of absorb a little sweat... Getting to graphic maybe, but hey, it's good to talk about this stuff sometimes! Thanks for the suggestion though! No tanks there just now, but oh lordy, they have Freja boots at 50% off. Time to close the laptop and just walk away. I just hopped over to take a look because it seemed odd to me that they wouldn't have any right now (and yes, I had to see those Freja boots at 50% off! ), and they do have a few actually. You're in Norway, right? Did you check T by Alexander Wang or just A Wang? Right now they have the exact one I'm wearing in the photo but in purple, but they also have his slub t-shirts in muscle shirts and tanks. I haven't tried the slub tanks, but I have a slub muscle shirt and I absolutely love it. They're a little sheer, but they feel amazing. I'm new to your blog, via Maja H, Kali, et al. I had that skirt with me in the H&M change room earlier today, but then I noticed that it had a hole in it so I didn't bother. I too have chub rub (horrible name!). Aren't the leggings so hot to wear in the summer? I see above that you like that they absorb sweat, but aren't they still hotter? As for the leggings, well, yes, they're kind of hot, but not that hot. I think it depends on the leggings. The ones I wear are really thin and lightweight, so honestly I don't feel that much hotter than I would otherwise. And the fact that I don't feel sweaty thighs chaffing makes it totally worth it. I also do biking shorts sometimes, but if your skirt is lightweight or a little bit tight then you see the line where shorts meet thigh, and that's not attractive at all. You have to sort of play around and see what works with what. Let me know if you try the leggings, I'd love to hear what you think. What do you usually do to avoid the rub? I go with spanx! I buy em a size larger so they dont suffocate, slip em on, and enjoy being chub rub (and underwear-line) free all summer! Hi! Thanks for the reply. Yeah, it was a series of holes - unimpressive. Do you wear those H&M leggings you linked to or another brand? I usually just cope with the rubbing, but you're making me consider this leggings idea, since it really is quite uncomfortable. At the moment, I live somewhere with brief summers, so it isn't too big of an issue. Well, the short summers are an issue but that is another conversation. The leggings I'm wearing now are from H&M from a year ago, but I'm guessing they are very similar. One thing you might want to do is check them out in person, sometimes the feel of them can depend on the dyes and the color processing. The ones I have are white capris and they are very thin and lightweight, but I can't vouch for the ones online right now. Do you have an H&M nearby where you can feel them? I've never been able to cope with the rubbing, I used to just wear pants all through summer! I do have an h&m nearby, I will look, thanks for the tip! I have to say I've never heard of chub rub but then again, I've never thought about it enough to do anything about it and it all sounds too hot to add extra garments underneath. I'm just about coping with our hot spell - I'm just staying in - I can't do "sweaty". I picked up the H&M maxi skirt as well in the burgundy but put it back. Too long but it was okay (no holes) and I love the fact that it had pockets. Your skirt looks very flattering - some of them bunch around the tum and make you look wide but yours is very flattering - the kind that I could do with. And I'm not big up on top but always bra up. But again, I think I would struggle with the extra layering. I don't really like socks even (veering off topic - possibly due to the anti-histamines kicking in - boy I hate hay fever!). And I love seeing you in outfit posts - your hair has grown! Thanks Sue, you are so sweet! I have to admit, even after so long I am still funny about the outfit posts, so it's great to get that feedback from you. And yes, my hair has grown a ton. The last cut I had was fairly hideous so I'm a bit traumatized and have been putting off going back, but it's been ages now and I really do need to do something about this (as my mom keeps mentioning kindly via skype, ha!). I saw the skirt in burgandy as well, such a pretty color! You could of course have it hemmed, or even do it yourself at home, but I could see how that would be too much bother for an $18 piece of fabric. As for the bra layering, I swear, that one's not even noticeable once they're on. Especially since those little gap bralettes are so soft and thin and magical. I also don't like extra layering or socks :) I wear smartwool socks almost exclusively and they are the least annoying socks I've ever had. Icebreaker and Teko are also good but smartwool lasts the longest. I just discovered smartwool socks last year, they are amazing! How can they get them so thin and comfy but still warm enough for serious winter?